More kids equals more chaos with extracurricular activities and sports. Learn how to limit and organize to manage everyone’s time! After-school activities and sports have many advantages for children — they expand a child’s interests, help them discover new talents, build their confidence and social skills, and provide physical activity and exercise that’s vital to health. Moms with several kids know it can be a big challenge to schedule and manage activities to make sure that each child has the equipment or supplies they need, get to the venue on time, pick them up afterwards and still manage to hold down a job or run a busy household. It’s a juggling act! Multiple kids means multiple activities. From football to ballet lessons, science club to cheerleading, kids have varied interests to explore, and it’s great to have them engaged in an activity that inspires and excites them. They also have other needs and responsibilities, and it’s the parent’s job to guide them and make sure that the child isn’t overextended. Consider that each child will have home chores and school homework, will need a good night’s sleep and should still have some free time to play and be part of family activities. Sit down with your kids to discuss and decide how many activities are manageable for your family. 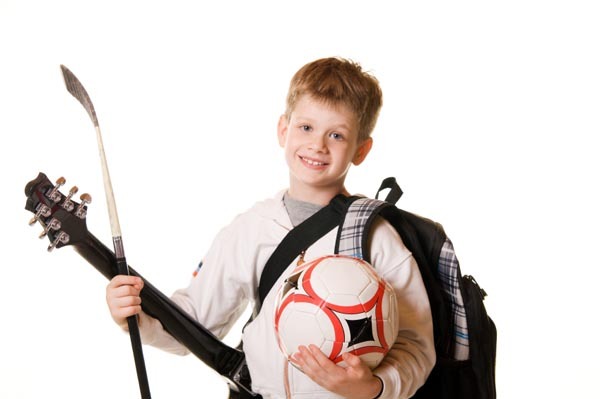 Many families let the children choose one extracurricular activity each season. This allows the child to concentrate on the sport or activity and teaches them to make decisions. For families with several children, scheduling activities for each quickly fills up free time. Ideally, your kids’ schedules will allow an open evening for the entire family to simply kick back and relax together! A chart will be helpful in organizing activities for multiple kids. Write out a schedule so it’s clear which child has an activity — include times, locations, carpool or transportation details and so on. It’s important that parents and kids are clear on where each child will be at any time, transportation to and from the activity and when the child is expected to return home. If your child is on an athletic team, post a schedule of the games and matches. Parents and siblings will want to attend these whenever possible to cheer the child on, but talk about schedule conflicts ahead of time so your athlete understands why if you can’t always be there. Have a designated spot for each child to store the equipment and supplies they need for their activity. It will save time and stress when it’s time to go — no frantic searches for ballet shoes, football gear or other necessities. Each child should be responsible for returning their things to the designated space so everything’s ready to grab and go. Create an activity center with a calendar for your children’s extracurricular schedules — color coded for each child. You’ll be able to tell at a glance which child has an activity on any given day! Keep a color-coded file for each child with parental release forms, lists of required supplies, your receipts and any other paperwork pertaining to the activity.